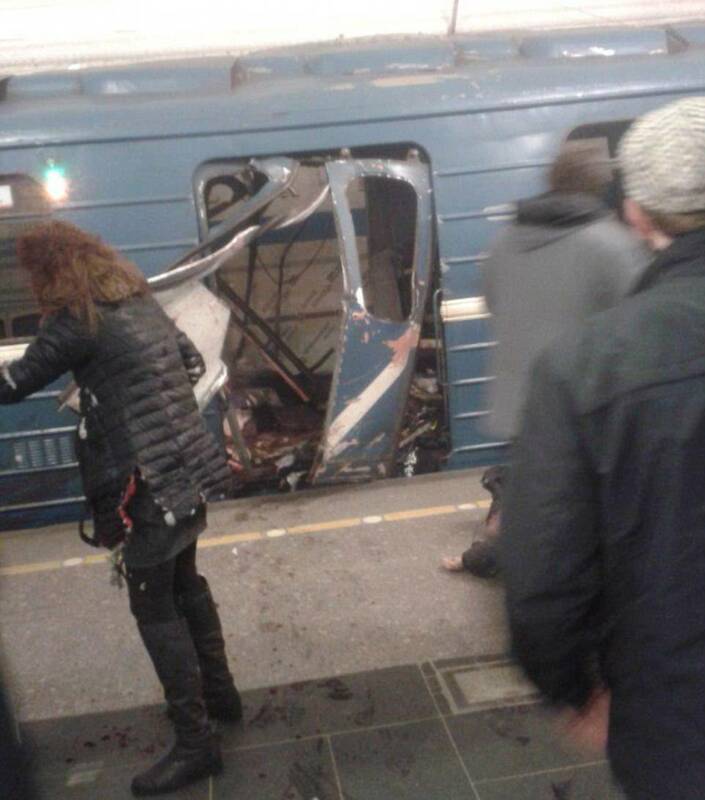 A nail bomb placed onto a train by a suspected terrorist has ripped through a carriage in St Petersburg killing at least 12 people and injuring 50 more today. 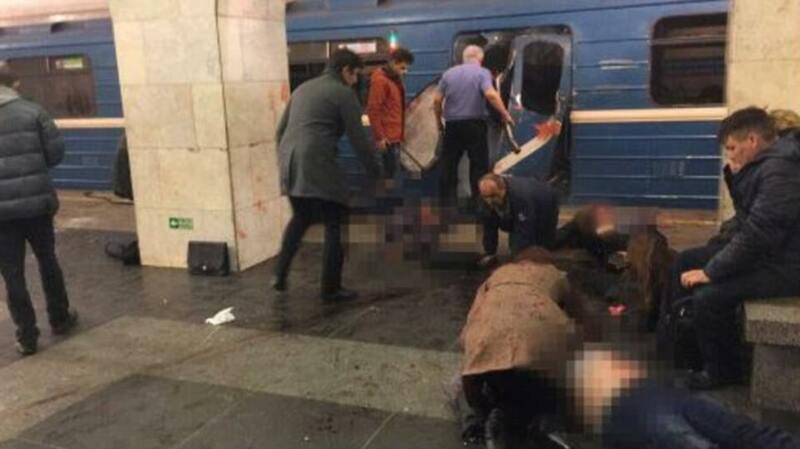 The terrifying incident, which is being investigated as a terror attack by officials who say the killer has been captured on CCTV, took place on a train that was travelling between Sennaya Ploshchad and Sadovaya metro stations. 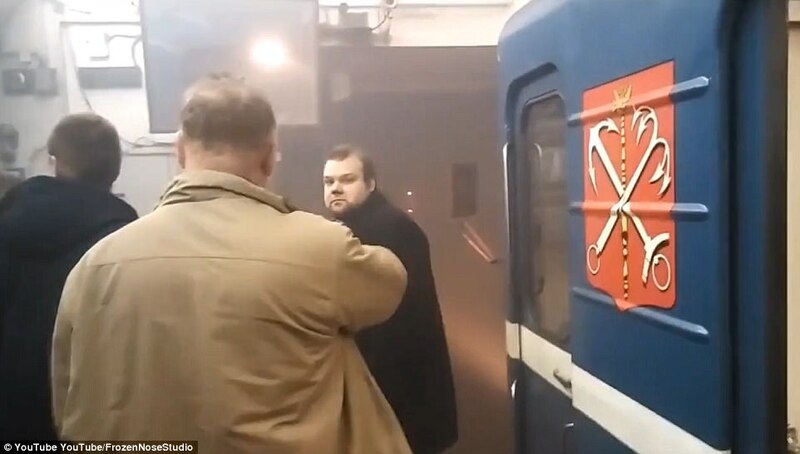 The attack has left dozens injured, including children, after it was reported a man left a briefcase on the train before moving carriagesmoments before the deadly blast and a second explosive device was found and defused in a nearby station. 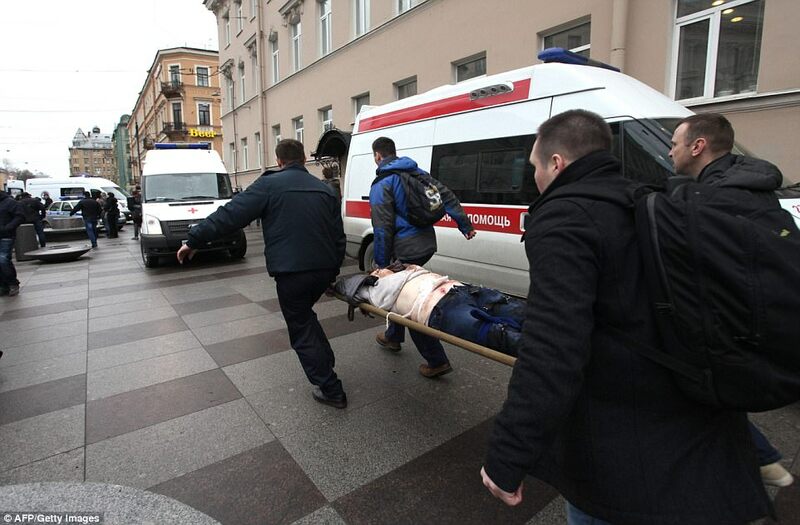 Vladimir Putin is in his hometown of St Petersburg today for talks with the president of Belarus and has confirmed 'there are dead and injured' and offered his condolences to the families of those killed. 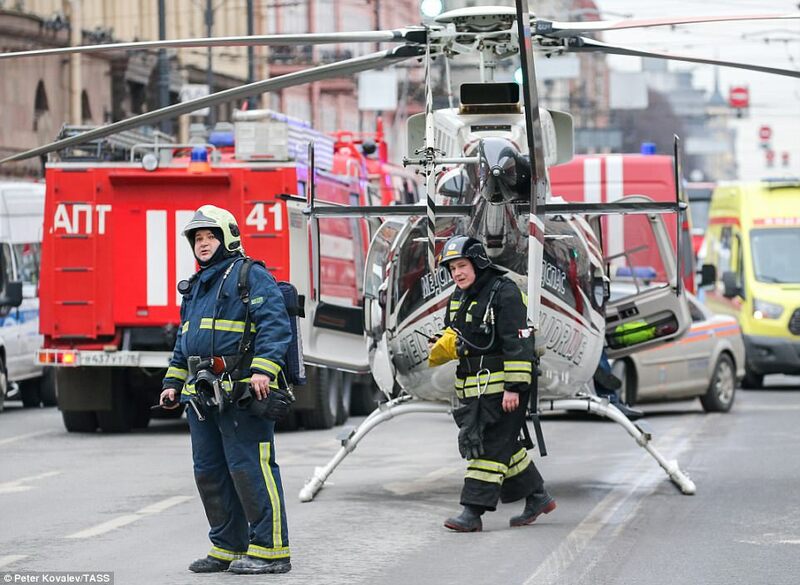 The Kremlin leader, who wanted to visit the scene in the aftermath of the attack but was held back by security services, said: 'I have already spoken to the head of our special services, they are working to ascertain the cause of the blasts. 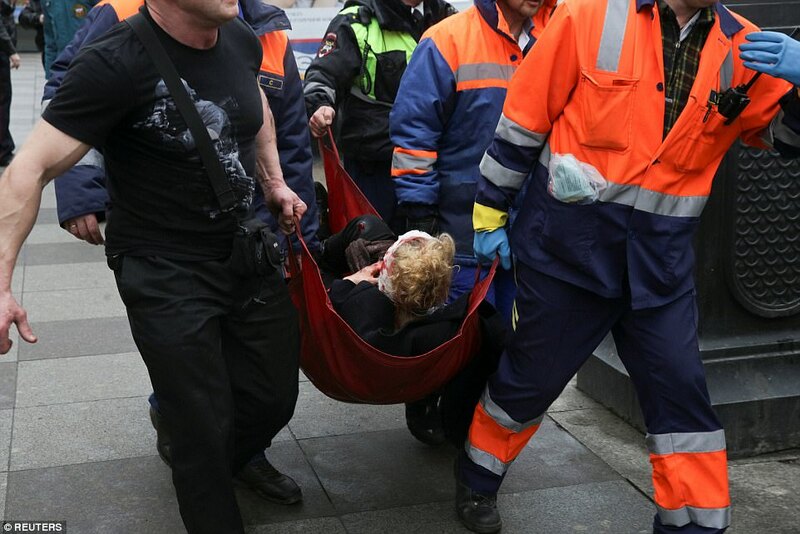 Kremlin spokesman Dmitry Peskov denied earlier speculation that President Putin was due to pass by the Sennaya Metro station around the time of the blast. 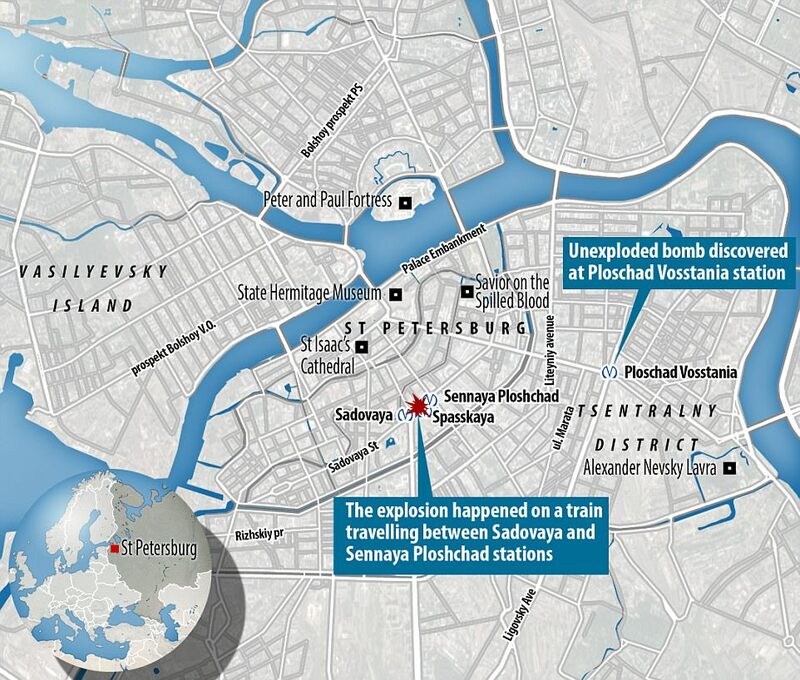 The explosion happened between the Sennaya Ploshchad station and Tekhnologichesky Institut at around 2.40pm local time, Russia’s National Anti-Terrorism Committee said. Earlier reports indicated a backpack had been thrown onto the train and witnesses also suggested there had been multiple explosions, but officials confirmed just the one blast. 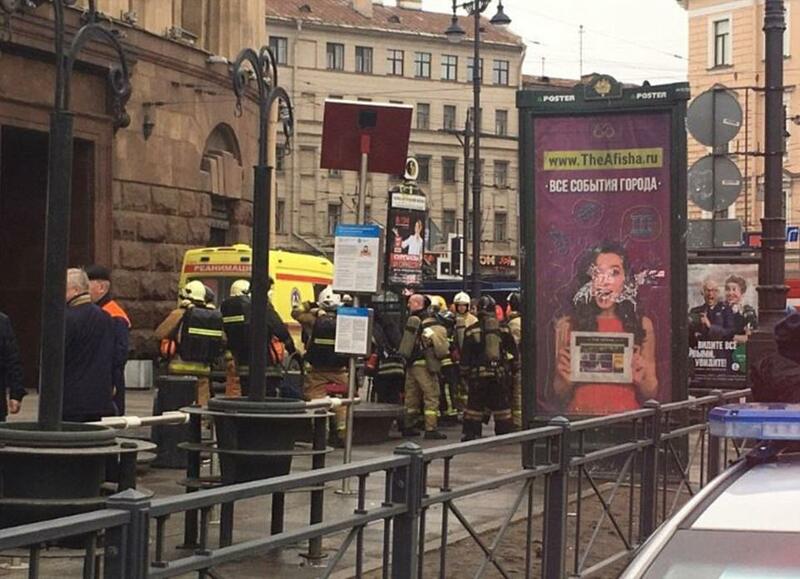 Russian security agencies did find an explosive device at a different metro station in central St Petersburg and made it safe, the National Anti-Terrorist Committee said in a statement. 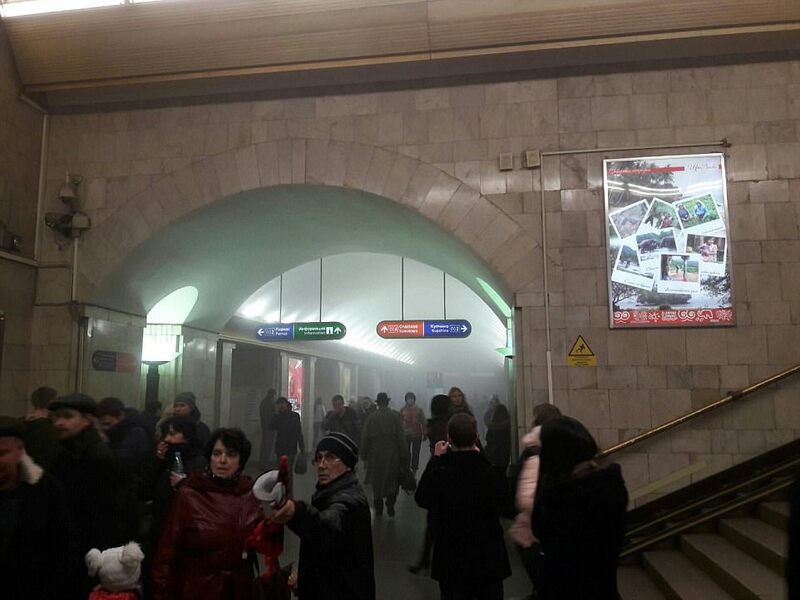 The device was found at the Ploshchad Vosstaniya metro station, a different location from where a blast earlier took place. Other witnesses also described a man leaving a briefcase on one carriage before moving to another just seconds before the huge explosion. 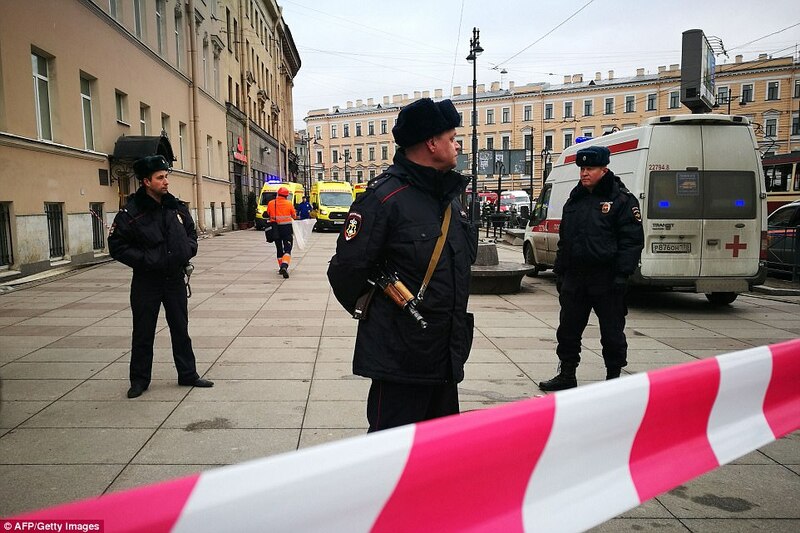 As reports of the suspected terror attack trickled through to the capital, Moscow heightened its security and local reports suggest three metro stations - Nagatinskaja, Savelovskaya and Ugrezhskaya (CIP) - were cordoned off due to suspicious packages. 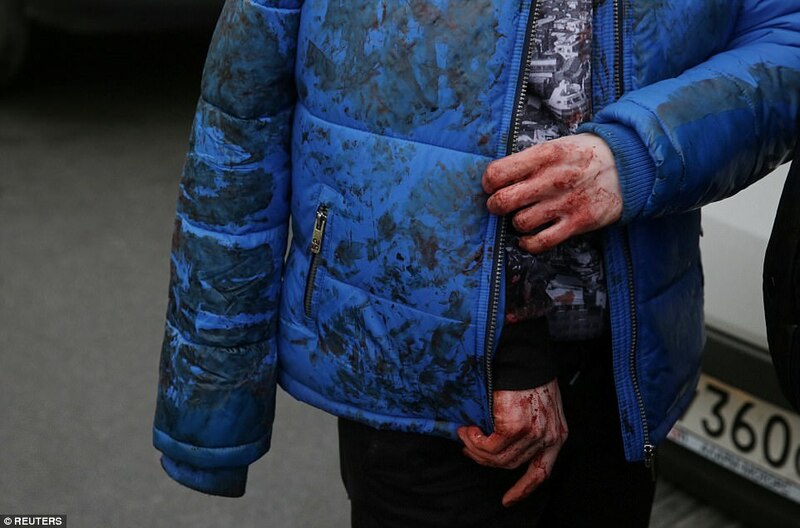 A witnesses told Russia's Life News: 'People were bleeding, their hair burned. We were told to move to the exit, because the movement stopped. People just fled. Eight bodies were recovered from the carriage while two more were found on the platform and the final two killed were found in the tunnel. 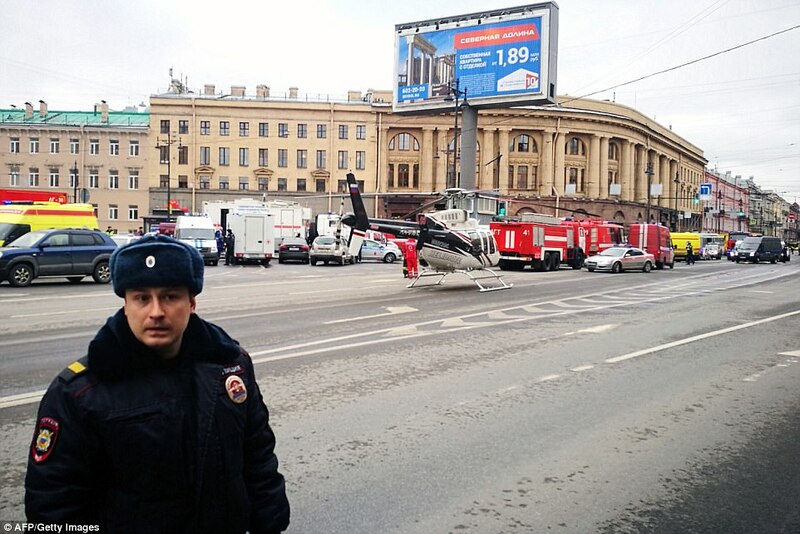 Russian President Vladimir Putin says investigators are examining all causes for the blast in St Petersburg today - including terrorism. 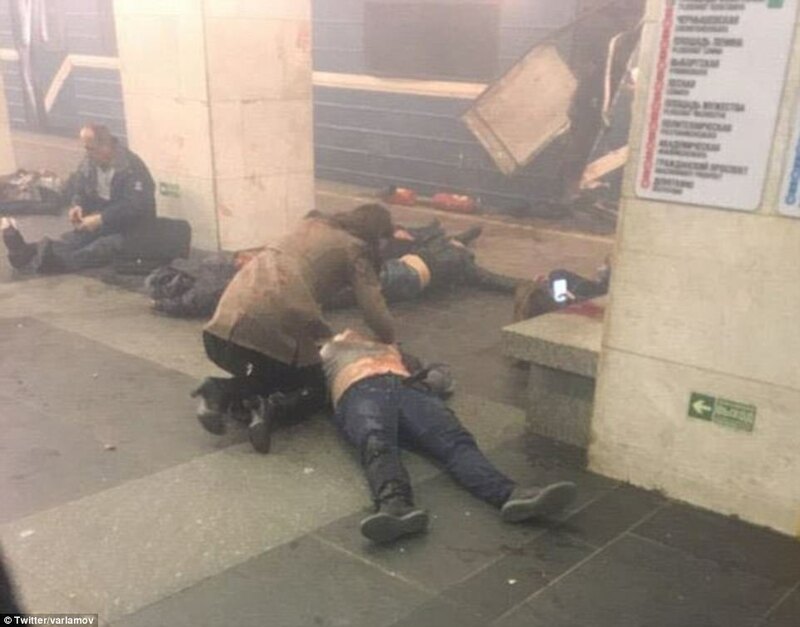 And while no-one has yet come forward to claim responsibility, the country's security services have previously said they had foiled 'terrorist attacks' on Moscow's public transport system by militants. 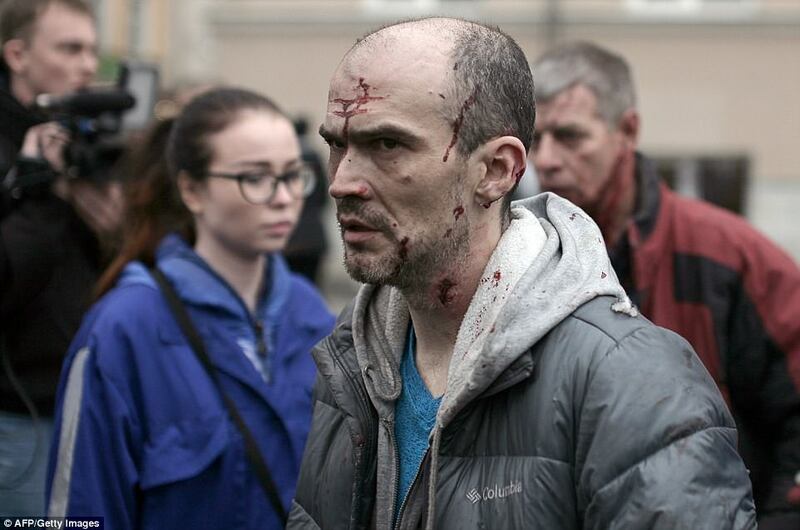 Russia has been targeted by different groups in the past and it is not the first time the country's transport system has been hit. In the past, deadly raids have been carried out by Chechen militants with rebel leaders threatening further attacks. But Russia, which has provided military backing to Syrian president Bashar al-Assad, has also stepped up security in major cities amid fears of an ISIS atrocity. In 2015, the terror group claimed responsibility for a bomb blast on a MetroJet plane from Egypt to St Petersburg which killed all 217 on board. The country has also been the target of attacks by Chechen militants. Over 330 people, half of them children, were killed in 2004 when police stormed a school in southern Russia after a hostage taking by Islamist militants. In 2002, 120 hostages were killed when police stormed a Moscow theatre to end another hostage taking. Chechnya was the scene of two separatist wars in the 1990s and early 2000s, but violence in the region has largely been suppressed under the iron-fisted rule of strongman leader Ramzan Kadyrov. Over the weekend, Russia said it had detained one of the attackers who carried out a deadly strike on a military base in Chechnya. A 21-year-old local man has been held over last week's attack, in which six soldiers and six rebels died. 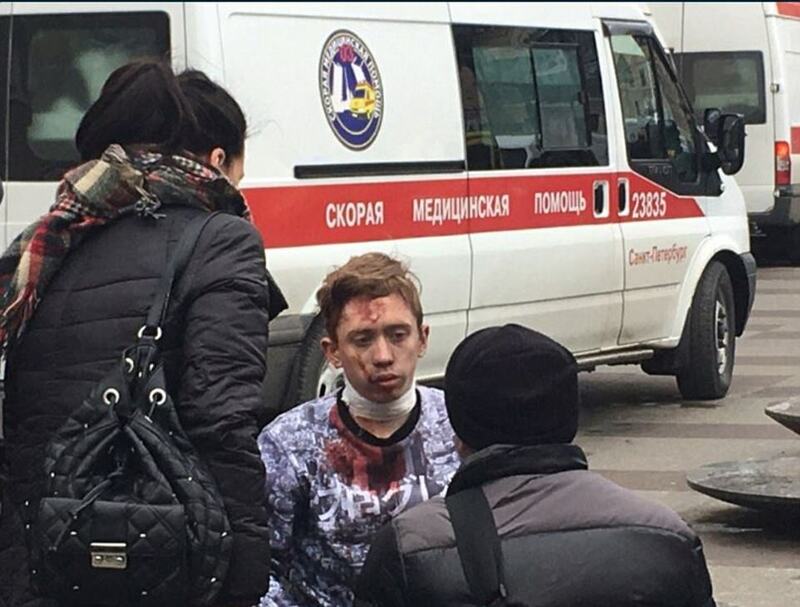 ISIS claimed responsibility for the March 24 attack, which targeted a base of Russia's National Guard, a new branch of troops which answers directly to President Vladimir Putin and is tasked with defending borders and counter extremism. A male eyewitness said: 'It's just like a war here. Every special service is here, the FSB, police, and multiple - really a lot of them - ambulances. 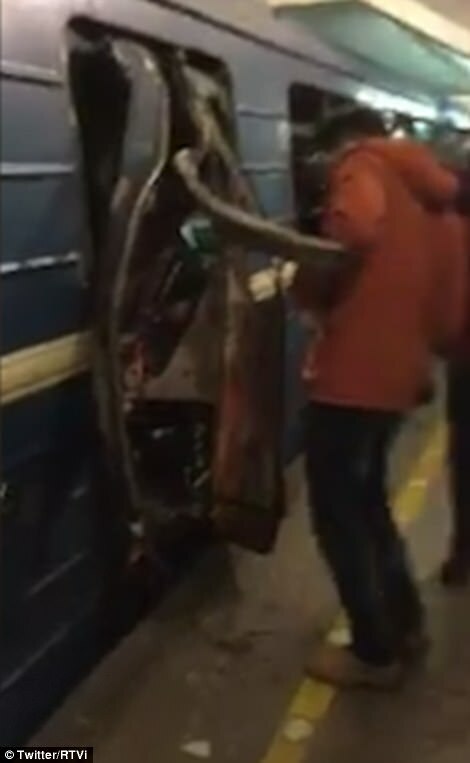 The Life News website showed pictures of blown-out train doors and several injured people on the station platform. Metro bosses said there were reports of a blast – from an improvised explosive device – inside a train. 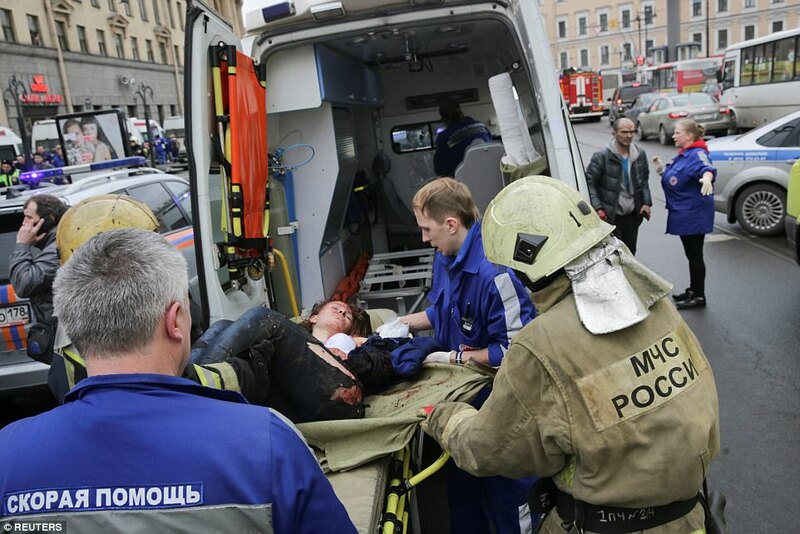 Russian news agencies quoted Kremlin spokesman Dmitry Peskov saying that Russian President Vladimir Putin has been informed about the explosion. 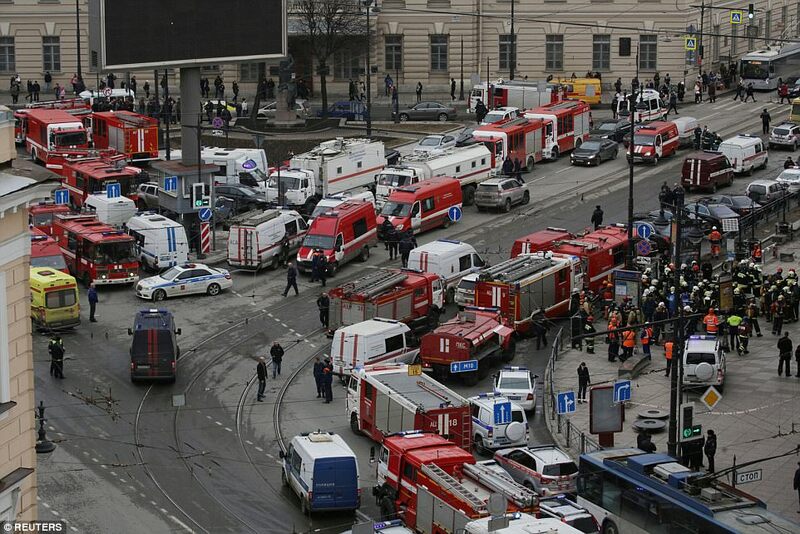 Islamic State supporters have celebrated the explosions in St Petersburg saying it was revenge for Syrian air strikes. 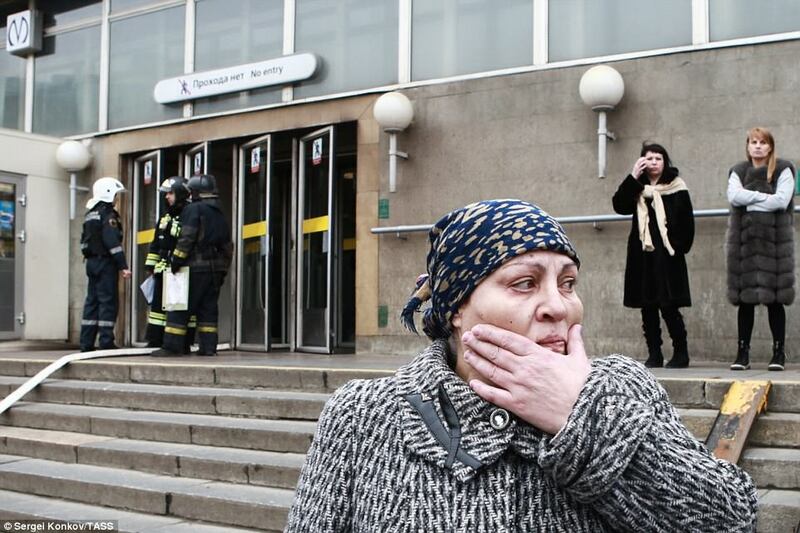 Others, according to Vocativ, said it was 'a metro to hell for the worshipers of the cross'. Russia has killed hundreds in air strikes against the terror group in the Middle East. 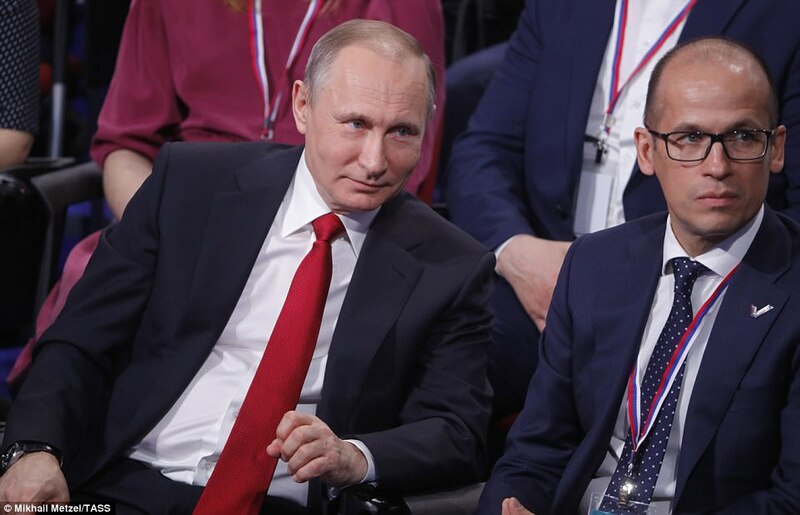 Putin is in discussion with the Director of the Federal Security Service who is inside the affected subway. 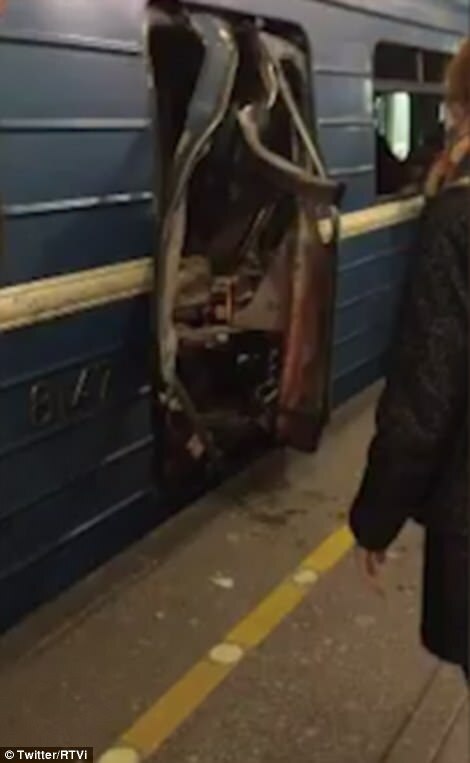 Polina, who was in the carriage next to the where explosion erupted, said: 'There was quite a lot of people in the carriage: everyone was sitting, some were standing. 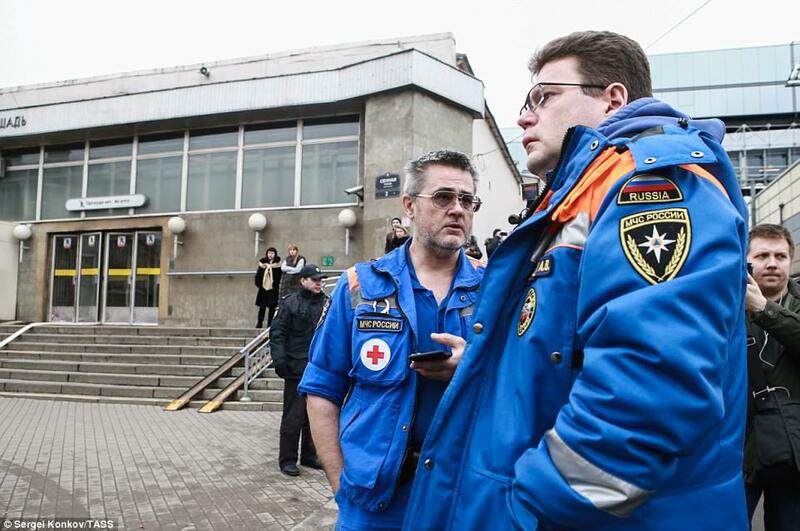 'The explosion occurred between Sennaya and Technological Institute stations. 'There was a deafening boom, and then a strong odour and smoke. 'We immediately went to another end of the car. It was very crowded. 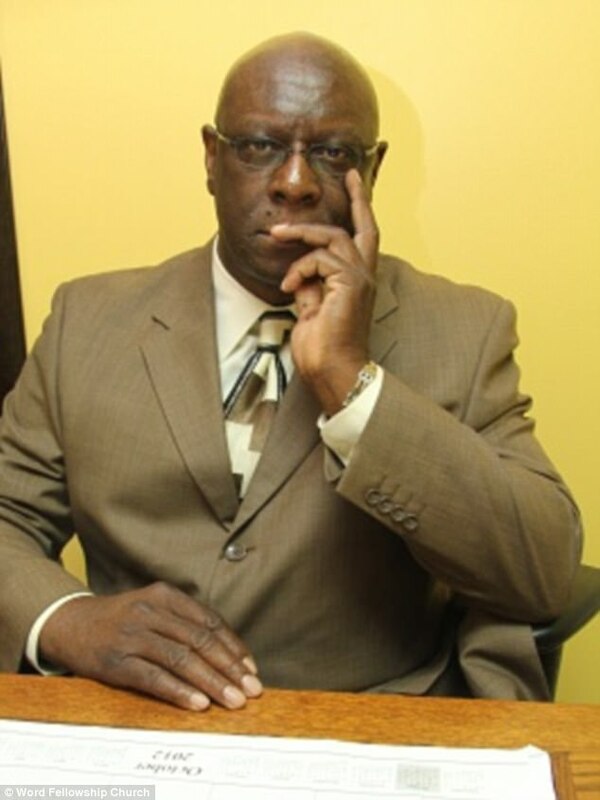 'We saw that the next car was teared apart, windows were broken, no lights, blood. People were dragged out of it, some were carried, some were walking with support. 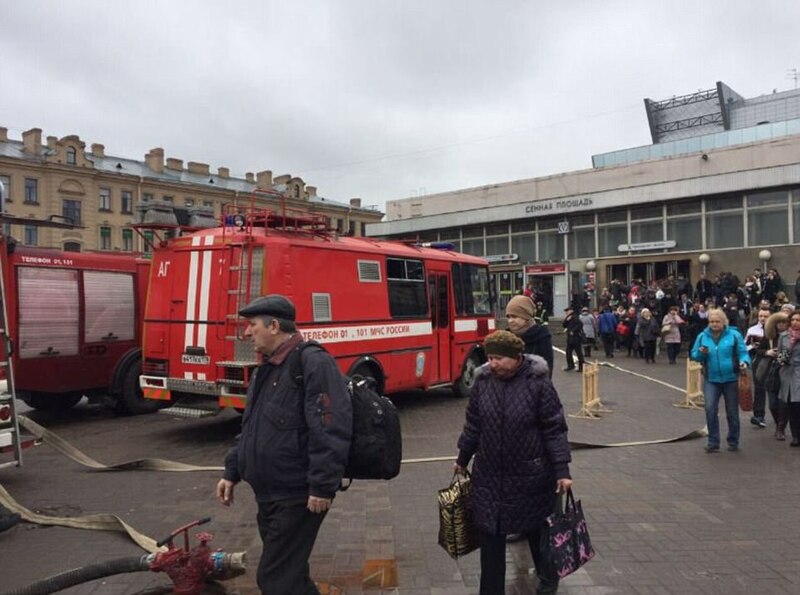 There were fears a second, unexploded bomb was left on a platform on the network in St Petersburg, but it transpired to be an abandoned bag. 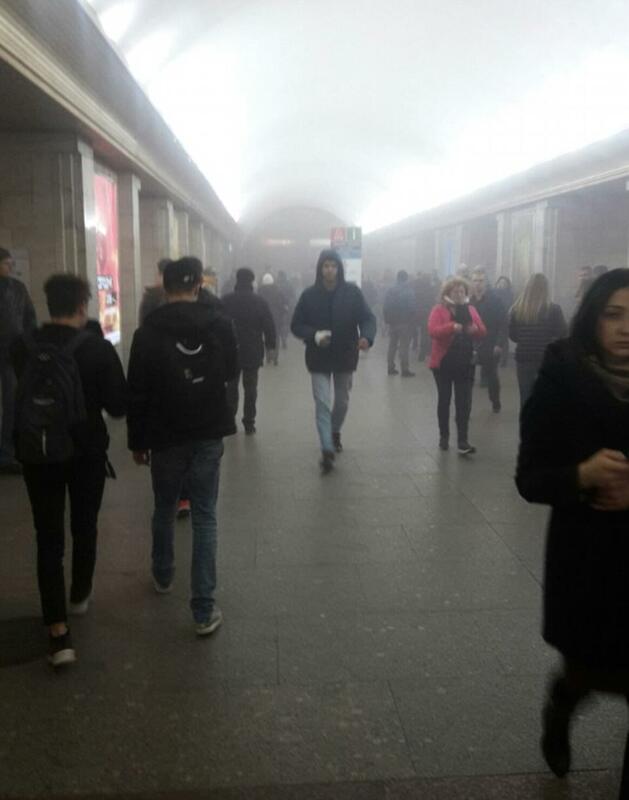 A subway worker who asked not to be named told local press: 'The second carriage exploded. Another witness said: 'Many people have sandy traces on their faces. Another eyewitness said: 'Everyone was ready for death in the metro carriage. Today, in our city there was a terrible tragedy. 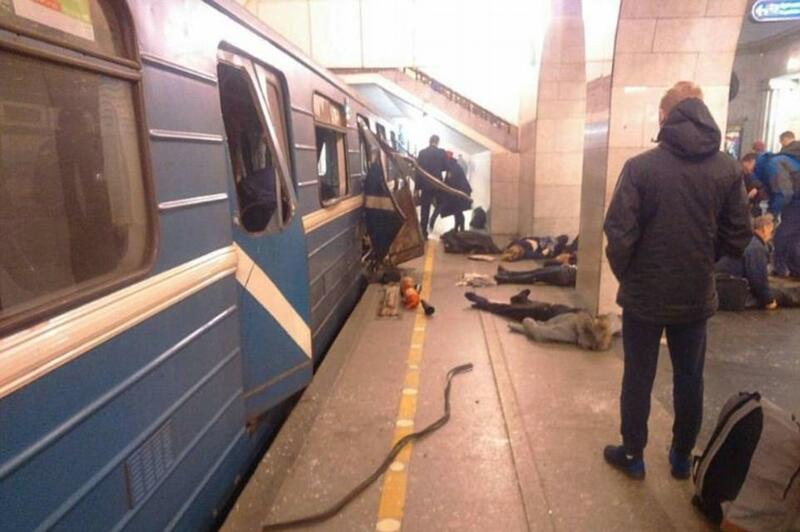 As a result of the explosion in the subway people died. Many of the passengers were injured. I express my deepest condolences to the bereaved families and relatives. 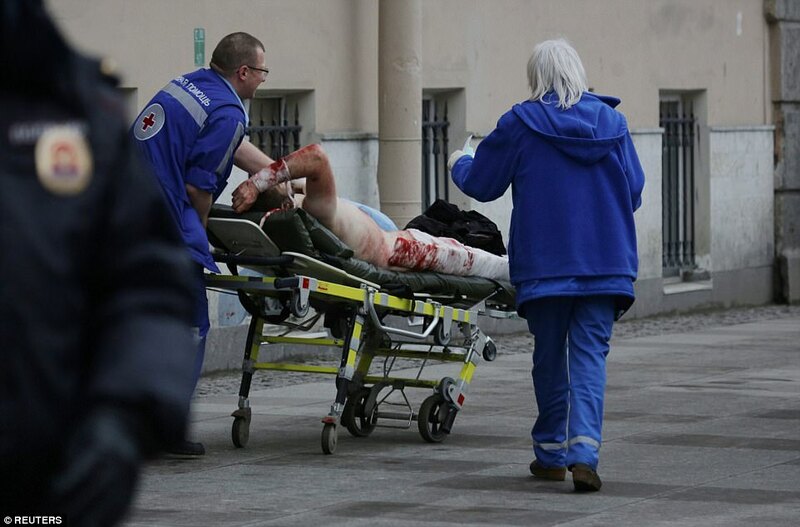 I wish a speedy recovery to those injured. Law enforcement authorities and all city services are doing everything necessary, which should be done in an emergency. 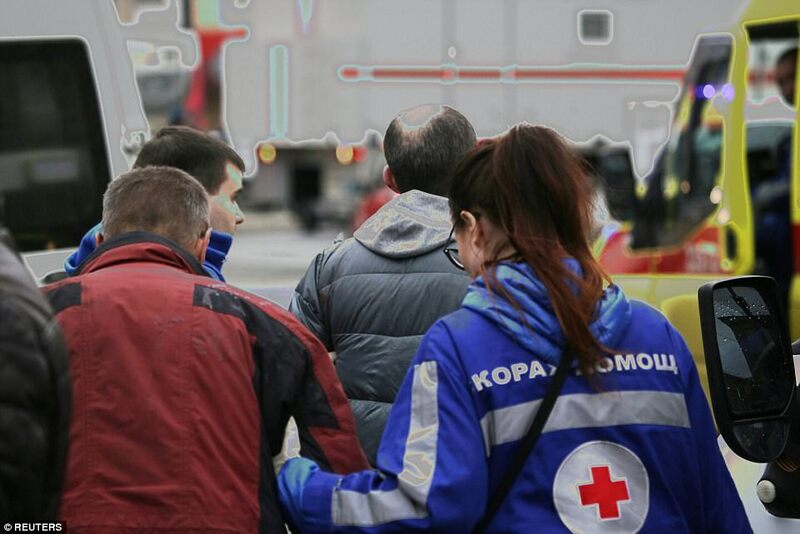 Medical services provide all necessary assistance to the victims. 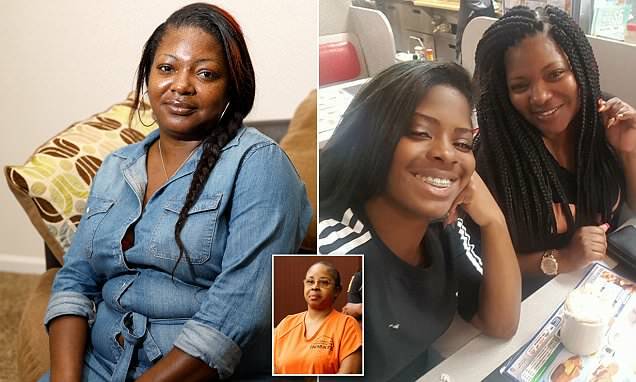 In this difficult time we all need to support those who lost their loved ones. I ask all of Petersburgers and guests of our city to be vigilant, attentive and careful, with all the responsibility to treat what is happening. 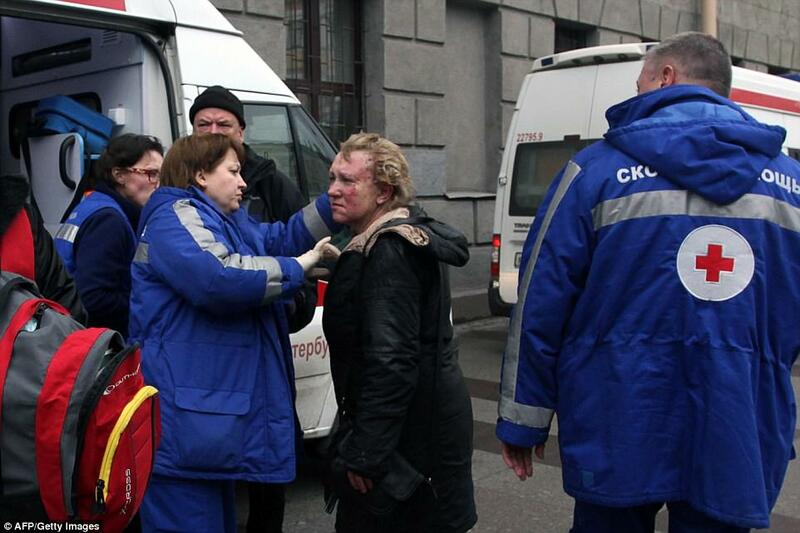 Saint-Petersburg Government will provide all necessary assistance to the families of those killed and injured. The leader of the Kremlin is visiting the city today and is expected to hold talks with the Belarusian president later in the day. Sennaya Ploshad is one of the Russian city's main metro stations, where three underground lines connect. It is beneath the large 'Sennaya' shopping centre as well as the offices of Gazprombank, Russia's third largest bank. 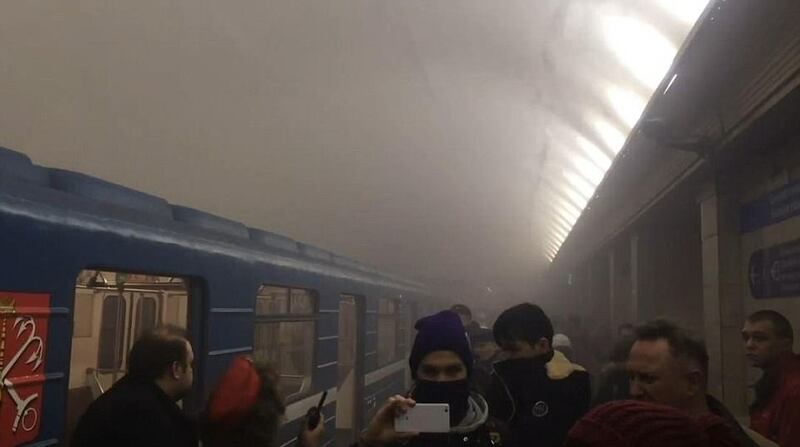 The St Petersburg metro said in a statement carried by Russian news agencies that it has closed two stations, Technological Institute and Sennaya Ploshchad - two neighbouring stations on one line - and is evacuating all passengers. 'Evacuation of passengers is ongoing, there are people injured,' it said. 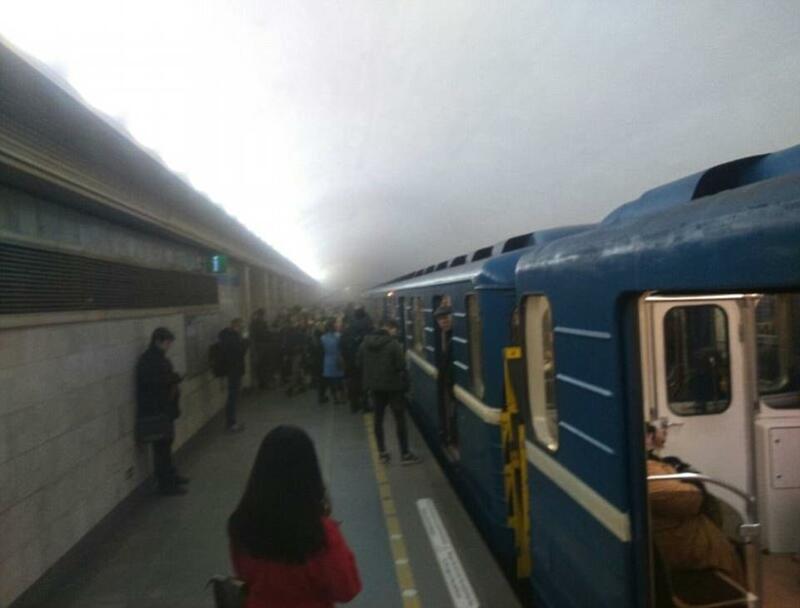 Following the reports, the Moscow metro also announced that it is 'taking additional security measures' as required by law in such situations, according to the network's official Twitter account.